Founded in 1996, in Boca Raton, Florida, the Cendyn Hospitality Cloud offers the most complete set of innovative software and services in the industry, covering hotel marketing, guest engagement, group sales, and event management. Over 20 years on, Cendyn’s offices now span from Boca Raton, Atlanta, Boston, San Diego, Toronto, Whistler, London, Munich and Singapore. Cendyn proudly serves more than 30,000 clients in 143 countries with enterprise spend levels in excess of $1 billion. Cendyn’s 20 years of success in the hospitality industry shows that they don’t just have innovative solutions – they have products that are tied to proven revenue producing business models. That means they understand hoteliers’ struggles. They have been on the hotelier side of the table and know how to make their lives easier and more successful. As a team Cendyn believes in delivering innovative software solutions designed specifically for the hospitality industry by hotel insiders. They provide exceptional support and service for their clients, ease of connectivity, fully-integrated solutions and above all 33x proven return on investment when leveraging their integrated CRM and data-driven digital marketing solutions. Cendyn is the leading CRM and sales platform in the hospitality industry and has been nominated for two World Travel Awards this year; World’s Leading Hotel CRM Technology Provider 2018 and World’s Leading Data Driven Marketing Agency 2018. They are also nominated for the same categories across three regions – North America, Europe and Asia. They are hoping to claim all titles and to defend their title for World’s Leading Data Driven Marketing Agency from 2017. Cendyn’s CRM Suite provides a marketing automation and guest intelligence solution that can easily handle complex interfaces, drive loyalty and leverage real-time data to provide personalised one-to-one communications for every guest, no matter what channel they came through. Their CRM Suite caters for every hotelier from large brand to small boutique properties; eInsight CRM provides enterprise marketing automation and guest intelligence for multi-property/multi-brand hotels and Cendyn’s Guestfolio CRM provides intuitive marketing automation and guest intelligence for boutique and independent hotels. 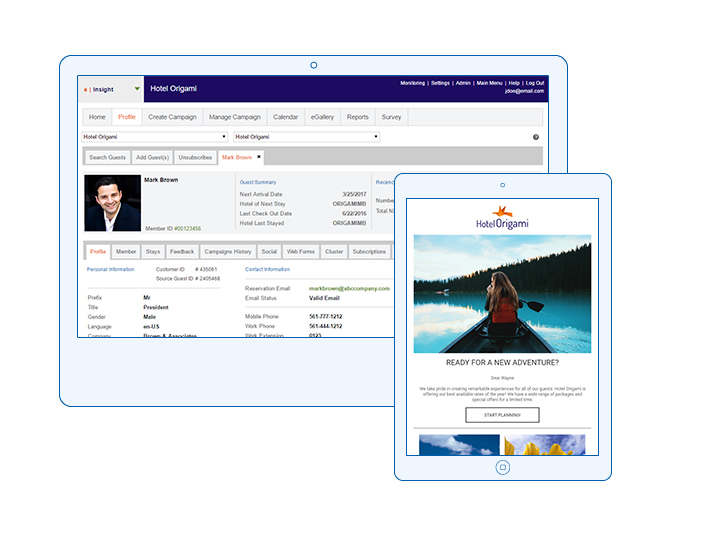 eInsight is a comprehensive CRM platform for hotels, that consolidates, engages and measures disparate data transactions on travellers throughout the guest journey. Business rules-based automation combined with dynamic personalisation and upsell opportunities drive revenue through multiple channels and helps hotels acquire new customers. eInsight’s guest intelligence solution utilises data collected from multiple sources to provide a true, single profile of each guest. This visibility enables every customer to gain a clear understanding about the history and preferences of each guest in real time, regardless of how they booked. Using sophisticated and learned guest intelligence from the guest profile, eInsight’s reporting and analytics can also be utilised by every department in the hotel to keep track of ROI and revenue growth. Guestfolio is the hotel marketing platform that drives guest engagement, retention and conversion throughout the travel journey. 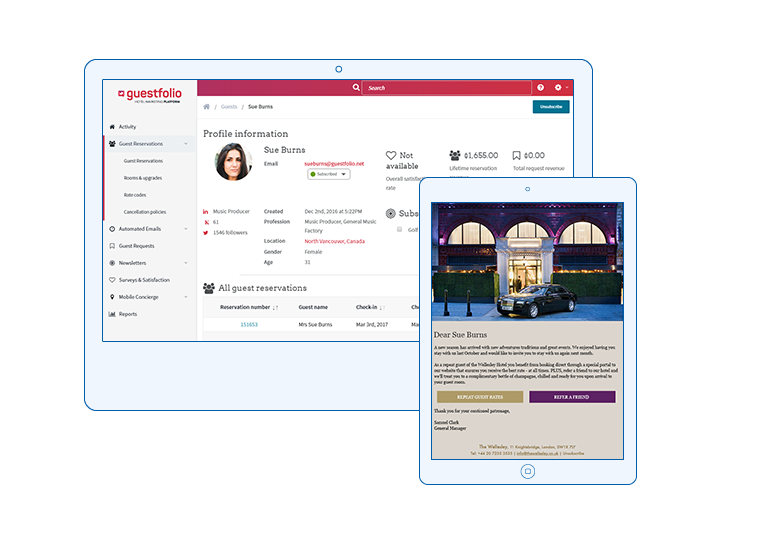 With the guest profile at the heart of what Guestfolio does, hoteliers can personalise the reservation experience, gain insights on their guests, use tools that build lasting brand loyalty and encourage increased conversions from OTAs to direct bookings. With over 150 integrations into their CRM Suite, spanning across property management systems, point-of-sale systems, spa software, food and beverage vendors, maintenance, security, and many more, Cendyn has more readily available data connections than any other CRM SaaS vendor in the hospitality space. By working with hundreds of partners across industries, Cendyn also provides the most consolidated view of hospitality data available to hoteliers. Using data to pave the way in how hoteliers communicate with their guests has revolutionized how they can learn more about guests’ interactions, drive direct bookings, maintain brand presence with their most valuable guests and stay competitive in their market. Cendyn’s CRM and Digital Marketing Suite enables hoteliers to keep their guests at the forefront of what they do, and concentrate on providing exceptional, personalised customer service at all times. 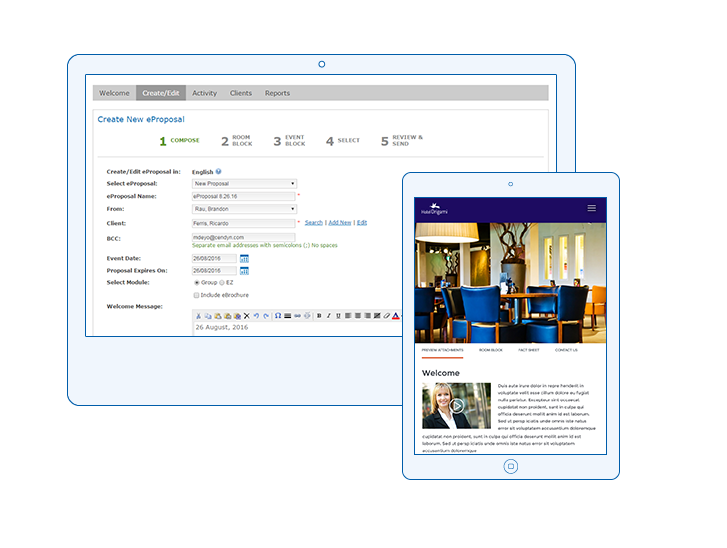 Cendyn’s suite of sales products enables hoteliers to drive their share of the group business. Tools including eProposal, eMenus, eContract and Getplanning enable lightning-fast, personalized responses and meaningful communications that are sure to impress prospects and help hoteliers win their business every time. With real-time connections to key hotel sales platforms, Cendyn’s award-winning eProposal allows hoteliers to seize first-responder advantage and dramatically increase group bookings by replying to RFPs in minutes. Trusted by more than 22,000 hotels, eProposal lets hoteliers rapidly create and deliver personalized, media-rich RFP replies on a branded microsite. This, in addition to real-time alerts to interactions with proposal, allows sales reps to react immediately to help close the deal. Cendyn’s client portfolio includes over 30,000 hotels across the globe and spans iconic large brands and hotel groups to small, boutique independents. A few include: Jumeriah, Onyx Hospitality, Minor Hotels, Omni Hotels & Resorts, Red Lion Hotel Corporation, Hilton Worldwide, The Standard, The Set Hotels, The Ritz London, Hyatt, Firmdale Hotels, Rosewood, Loews Hotels, Frasers Hospitality, Hard Rock Hotels & Casinos, and Event Hospitality. Cendyn loves the travel and hospitality industry and pride themselves on providing solutions that deliver personalized guest experiences that drive repeat bookings and profitable revenue growth for hotels and resorts. Tired of the Beaten Path? Discover New Travel Destinations Now!